Earlier today, my site suffered a malware attack due to the fact that I was using an outdated version of Word Press. At the moment, Google finds my website a threat even though I have had the bad code removed and updated my blog. I am hoping to have that issue fixed soon, but you may not be able to get on with Firefox or some other browser. Also, please be aware that my blog is safe and so are my links to my Sims creations. I made a mistake with not updating Word Press and I now know better, but I would never purposely put questionable content on my site. There might be broken pages or something that I may have missed, but it is late and I am tired and I’ve been working on this issue for hours. If you see something wrong, please point it out to me. Thank you. ETA: The issue appears to be fixed and google no longer sees my website as a threat. Hey everyone. It’s been a while and I bring you a new set. 🙂 Do you ever wish there were more clutter in your horse barns? I do. 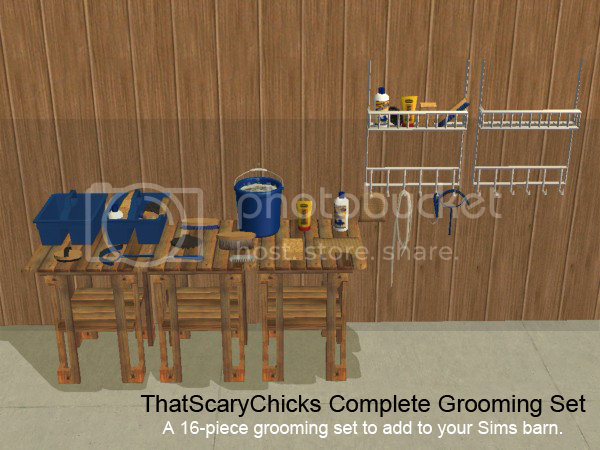 So, for a while now, I’ve been working on a grooming set to give my horse stable a bit more realism. In this set, you will find a variety of different objects that you would find in someones real barn. There are a couple of different brushes and other grooming tools and holders for them. (This is just clutter. The Sims don’t really use them.) I wanted to add more things, but I really just wanted to finish this set up so here you go! There are 16 different meshes offered and a a few offer recolors. I tried to give each mesh a unique name so you can easily delete the colors or objects you do not want. Although, many of the main mesh objects are black so you need to keep those for everything to show up. * The sweat scraper and tube bottle isn’t included in the full grooming box. * There are multiple items not included on the full rack as well. Here are 9 new poses to go along with Dragon Slave’s Basic Horse. They are focused on the trotting, cantering and galloping movements. You need to have DS’s Basic Horse downloaded for these to show up. Here are 6 new poses to go along with Dragon Slave’s Basic Horse. You need to have DS’s Basic Horse downloaded for these to show up.